Beautiful Ocean Front Home with 2 separate but connected living spaces including 2 kitchens. Perfect for an extended family (grandparents plus grown children), or 2 families vacationing together. House has an incredible 220 degree Panoramic Ocean View and over 900 feet of waterfront. 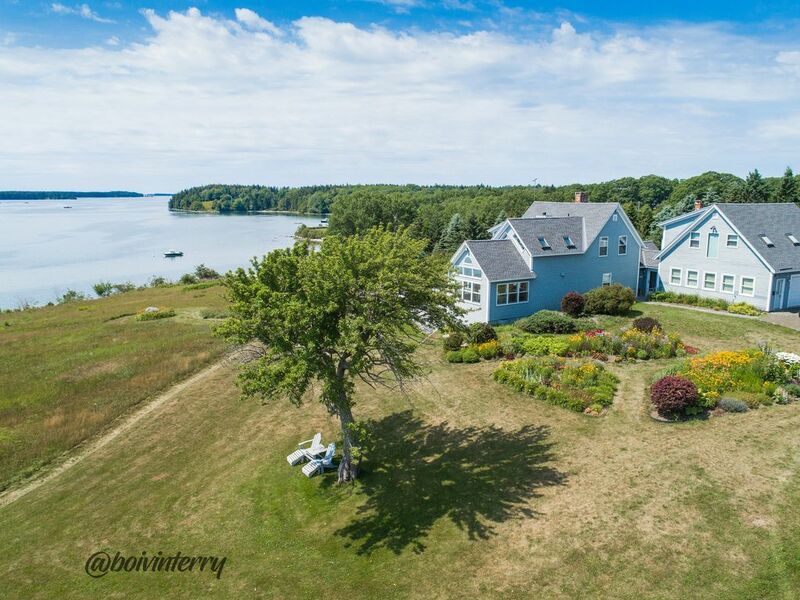 It sits on 10 gorgeous acres, surrounded by wildflowers and planted flower gardens, with direct water access, a sandy beach, and a 200-foot pier. Enjoy post-card perfect scenes of lobster boats and seals from the decks and every window. 4 adult bedrooms comfortably accommodate up to 8, plus 3 additional beds for kids (total beds: 2 kings, 2 queens, 1 double bunk and 1 single). 3 Full Bathrooms. Fresh lobsters, clams and fish can be purchased direct from the fishermen within 1 mile at a local lobster pier. Lobster boil and delivery services can be arranged via property manager. Local area activities available include boat and kayak rental, museums, golf, hiking, shopping, and much more. 220 degree view up and down the bay - water, water everywhere! fully furnished with dishes, pots, pans, etc. Property Manager will also prepare handle additional items like a seafood boil, coordinate boating trips, etc. Blue view is located on a spectacular and stunning price of waterfront property. Our two standard poodles loved the wide open space. Bruce, the owner, was very accommodating and helpful. The home has incredible views all through the inside and an expansive deck. We loved it! Thank you to Bruce and his team. Two thumbs up! It was a beautiful getaway staying at Blue View House. The house is well stocked, instructions were clear, the owner was quick to reply and made sure our stay was smooth. The view of the house is breathtaking and perfect! We spent mornings out in the patio soaking in the view. Our only regret was that the stay was too quick and the foliage was not in full bloom. I highly recommend this house. I could not have asked for a more beautiful location or well appointed home. Friends and family were guests at various times during the week and all were thrilled with the place. We kayaked, ate lots of lobster and hiked Acadia. Waking up every morning to lobster boats on the river and kayaking next to seals was an incredible experience! If you cook all your needs are met and the outdoor propane grill is a big plus. We had a great getaway here - our goal was to rest, read and enjoy the water, and we succeeded. It's clearly a house that is used regularly by its owner and therefore taken care of quite nicely. incredibly well organized house/kitchen with labels; perfect for us; we got lobster from down the street; took a sunset sail from Camden; read on the rocky beach; and enjoyed the Olson House museum (where andrew wyeth painted fequently); very happy overall. This was our third stay at Blue View in Cushing ME. Excellent accommodations, rustic, refined and private . The panorama gives you the feeling of being on your own island. The waterfront beach is an added plus! Always a pleasure. This made for a perfect family birthday celebration. Incredible views. 10 Acres on the water. Pier. The beauty will calm and refresh your entire family, while offering lots of fun Maine coastal activities in the area.